Accommodation: To its guests the hotel offers 69 stylish rooms, 13 junior suites, 20 luxurious apartments and 2 VIP suites. All units are extremely bright, have an individually controlled air-conditioning, personal safety deposit box, mini-bar, satellite TV, electronic admission cards door locks, internet access, IDD telephone and modernly equipped baths. 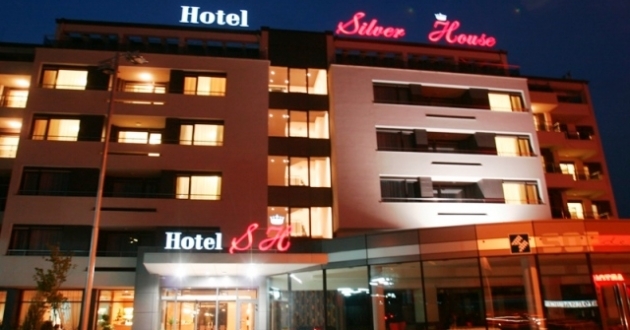 Situated on the ground floor, Silver Hall offers to its guests various types of set up according to their specific requirements. Maximum seating capacity is for up to 90 delegates. Located on the first floor, Crystal Hall is really bright and appropriate for events demanding seating capacity of up to 110 guests. In the immediate proximity of Silver Hall is the tiniest of the three venues - Emerald Hall. Extremely appropriate for company training and business meeting with a maximum capacity of up to 27 representatives. The hall has a plasma TV screen which is a suitable alternative to the standard presentational equipment. In the main building of the hotel, available are two small halls with a capacity of up to 15 guests each, convenient and pleasing for executive type of meetings or training. Both of them are air-conditioned and offer unlimited complimentary internet access.